How to make money beyond teaching and get out of rat's race. Discover how to earn extra income outside of teaching and learn how to get closer to your financial freedom goal. Are you fed up teaching every day? Do you feel that you are being disrespected on daily basis? Finished up your cert and hoped for the best, but it turned out to be not so good as you have hoped for? Did you dive into teaching to perhaps be a hero, but realized that it may not be for you? Did you dive into teaching field to have security blanket, but realized that such security blanket took a lot of effort to go through schooling, only in return to be less rewarded as all the other folks in other professions? Do you feel that what you do on daily basis at your teaching job is not being appreciated? Do you feel that perhaps there is something you can do but not sure what to get out of such nonsense and be respected for your time and your achievements and be more rewarded for your actions? Do you feel that your advice that you provide to other students (the students that you teach) doesn't make much difference? Do you feel disrespected by students/parents and by school administrators in anyway? Do you feel that someone of your caliber with possibly masters or bachelors degree should be getting paid more then what you are currently getting paid? Do you feel that you spend lots of time grading other students homework and doing work outside of school... when you could be doing something more for yourself? Do you feel that you are not enjoying teaching in group basis in public schools.. but perhaps maybe still enjoy teaching on 1 on 1 basis? Do you feel that the amount of salary that you are getting is simply not enough? If the answer is yes... Then be prepared to to buckle up and sit tight in your chair... because you are about to be taken upon the wild journey. Even if you are worried about money... there is a way you can get it... and there is a way you can place your mindset in the direction of not just being a zombie working teacher on day by day basis, but being able to get back your precious time doing what you already perhaps enjoy doing on some level (such as 1 on 1 tutorin on part time basis), while simultaneously injecting your mindset in the direction of the financial freedom goal. In this article, what you will find is a description of my getting out of rat's race thoughts.. someone who is at similar caliber just like you.. certified teacher or perhaps even if you are not certified teacher just yet... what i am about to show you will still apply to you as well. Learn what incomes will help you generate income on part time basis, when you do get out of the full time teaching job. Learn how you can set yourself up ahead of time... before you pull the plug and fire your boss. Other blogs out there.. only focuses on helping general population for how to get out of rat's race... while me Rome Wells focuses on yes... also general population, while keeping teachers in mind. 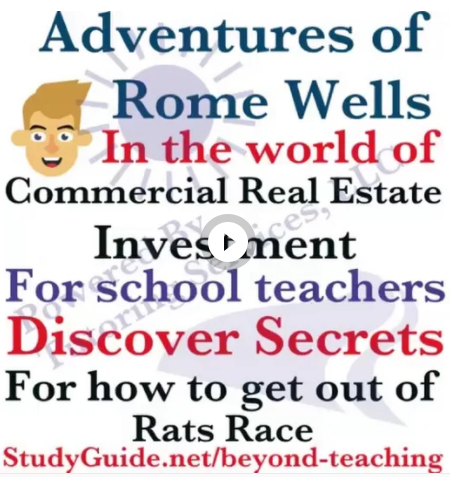 Read my advice/thoughts/strategies/tips/secrets/reviews and motivational content below for how you can get started in the world of commercial real estate without being super duper business person, but learn how to become one along the way with Rome Wells. My focus in my journey is to ... help me get out of rat's race... but.. i don't mind sharing my thought process and secrets with you (my fellow teacher or future certified teacher... , besides it's a lot more fun going through the same journey together than on your own), simply becauseI didn't mind sharing my thought process to thousands of other folks in every other field that i have researched before i dived into commercial real estate in January 1st 2018. Note what you will get from this article is the guided approach towards your financial freedom goal. My goal here is to help you discover your own potenail and your level of comfort, and let you know that yes... you can do it.. regardless if you are a current school teacher or someone who is about to become a teacher... you can make huge huge huge huge progress towards your financial freedom goal by diving into commercial real estate, but doing so in a way that actually doesn't place you at huge risk, doing so in a way that can help you minimize risk and be able to see the math and numbers behind every deal. All you have to do is simply take action and follow me on my facebook group... to see how blog about commercial real estate field and what I am trying to engineer behind the scenes to help folks get out of the rat's race. Other folks only talk about commercial real estate and don't really talk much about streams of income that you can leverage... to help you get out of rat's race..
Me on the other hand is like the rat that runs in the treadmill constantly trying to find way to get out... So why not listen to someone who is attempting to get out of rat's race... vs... actually listening to someone who already got out of rat's race... only? So what I will show you is how to learn commercial real estate field and infuse your mind with higher level of comfort in taking action... My goal here is not to just give you confidence... but to push you to the level of believing in yourself... rather than being zombified by the overwhelming influence of others behind the scences who are pressing upon your every action in the direction of... doing what's good for big corporations... vs what's actually good for you! Now what I am about to show you is the way out.. just remember... if you are going to read what's shown next... do consider.. taking action... advice/reviews/recommendations/tips and tricks and secrets that I provide are FREE. Sure there are some resources that are not free, which I also share with folks... however these resource act like the time saving mechanism... where you can minimize the amount of time you learn about... commercial real estate field dramatically. Remember doing everything yourself and learning yourself everything random is possible... however... it will take you a lot longer then studying structurally. So what am I about to tell you next? Consider reading further below... then after reading below, consider visiting references to urls I provide... follow these references until you stumble upon my commercial real estate facebook group. However before you visit my group... read how to get started below. So ready to get started (but before you do ... read this)? Also note... I realize that many of you will want to see how to get out of rat's race using passive income, but what I will be providing as advice is the combination of suggestions for what you can do both passively and actively at least in the initial period of your journey. As I help you discover how to make money passively, what you will do with this information will either super charge you to continuously wanting to dive into the commercial real estate further, while also keeping one of your teaching feet on the ground. One foot in commercial real estate investment and the other foot in making money actively on part time basis. What I will show you in this article are guided steps in the direction that can help you dive beyond teaching, because face it... making money teaching... salary wise... is no where near as good as other professions as crazy as it may sounds for someone like you the reader... someone who got most likely master's degree someone who wants to dive into american dream but gradually begin realizing that the expenses for anything you want to do outweight your desires and needs for wanting to travel to more vacactions, for wanting to not feel like you are being locked down to having to wake up early and giong to work every day. About me and how I can help you get out of rat's race in 3 to 5 years or obtain your freedom back of being your own boss. Hi, my name is Rome Wells. Certified Math Teacher for the state of CT and I figured I share with my fellow teachers secrets in how to add some additional income to your daily lives outside of your daily full time teaching job. What i will show you is how to jump outside of your full time teaching job and reveal secret field that can help you get out of rat's race. I will do that by first telling you a bit about my backgound and share with you some of the ways that can help you make part time income in the process of describing my journey... then I will show you what field I discovered 10 years later after helping folks like you... and how i reached the "aha" moment... in knowing what I want to do next in achieving financial freedom goal.. and how you can do it too. I realize that you maybe attempting to get a teaching job or perhaps trying to get ceritifed, and I also realize that teaching income is not that much in comparison to other professions. In fact what you are looking at is my very own search engine that i have created for myself and for other teachers whom I can trust to be part of my network. The very same teachers who can make money on part time basis doing something like tutoring other students in math, english, science, you name it. The reason why i am writing this article here is to show you what you can get yourself exposed to on part time basis outside of your teaching job, so this way you can make some extra money. So in case if you are studying to become a teacher, remember if you are certified the more money you can get for tutoring other students... but also remember not too much money... and it strictly depends on how much... you can get... meaning it all depends on the market.. In case if you have already finished studying and already have prepared yourself for a teaching career and became a teacher, or perhaps realized that teaching is not for you after becoming a teacher... or perhaps realized that you want to do something beyond teaching... to supplement your income... then continue reading further. I realize that working with students in school on daily basis is a very difficult task. I realize you may say to yourself that this your passion, but i also realize... that the fire of passion can some times stop burning.... or perhaps it can be burning less as the time moves on further and further. It sometimes may feel that you are just waisting your time... correcting homework and being disrespected by students. I know how it feels... it happened to me... I was being disrespected by students... and I just simply couldn't handle the world of teaching... I give lots of respect to teachers who are out there on the front lines fighting daily with their lives to bring bread on the table, which is precisely why... I Rome Wells, have decided to help teachers to bring more bread on the table. The first thing I did was... I created search engine... that allows teachers to register free of charge and advertise their Tutoring Services, so other students can find such teachers and hire them (to essentialy help you the reader make more money teaching on 1 on1 basis either online or locally without paying agency recurring fees). Most of the websites out there charge students outrageous agency recurring fees from every hour teacher tutors... Well that is just plain rediculous. I felt like the entire world of business was carried on top of educators backs... where hard working class teachers would have to carry business enteurprenus on their backs and be contributing to bringing home less and less money from every tutoring hour... just because agencies out there eat up 35 to 70% fee leaving folks with chump change! I felt that that this was no way to live the life. I felt that I had to do something for teachers to help them carry less weight on their backs... So I created TutoringServices.com search engine where I simply eradicated any agency recurring fees out of the picture. Which is pretty much the fee that student/parent pays upfront for the first trial 1 hour lesson, and after paying that first $15 trial lesson the remaining of the lessons are done direct without any agency recurring fees. So i stared thinking how to do that, and what I came up with is... with this site.. CallMyTutor.com If you visit this site you will see for example my tutoring profile, discount packages I offer, and subject i teach, practice test I offer to attract more students to my profile, video tutorials that can show my passion in particular subject and expertise, my teaching certificate that shows my level of education and brief info about why someone should even bother hiring me. So what I decided to do.. next is ... simply offer something else to teachers... i decided to offer teachers flexibility to get out of rat's race and be able to quit their school teaching job in 3 to 5 years. So i thought hard about this.. an in January 1 2018... i had a breakthrough, aha moment..I discovered something that I wish I discovered earlier. Note it took me 10 years to discover the field, the 10 years before that since 2008 to 2018 i was wondering around doing other things... such as well... helping teachers... except... the thing is... while i was helping teachers.. i simply didn't get appreciated enough for all the things i have done for teachers... and i simply wanted to do something where i would get appreciated enough for my efforts... and the field that I discovered that can help me do that is.... you ready for this? The secret field that every one knows about, but scared to dive into. This is the field that helped me get to my aha moment in January 1st 2018 is when I had the "aha" moment and realized that everything I was doing before was leading up to ... commercial real estate investment business. Well if you are .. then congruatulations you are on the right track... except the only difference is... there are many tracks in real estate..... itself.... luckily given the circumstance that I am a teacher myself and enjoy tutoring... it became relatively simple for me to dive into this field of real estate and start sharing secrets for how to generate wealth with other teachers, laywers, project mangers, IT cyber security Engineers, doctors, accountants, UPS post officer workers, police officers, firefighters and beyond. So now you may say... Rome Wells.. but wait.. what about... your search engines.. and why are you sharing all this info with teachers who are barely certified and far away from buying any type of multi-family properties... or not have money right now to do so... why are you sharing these secrets Rome Wells with honest hard working teachers? This is coming from certified math teacher for the state of CT (the trusted figure... see my certificate in my tutoring profile), 21st century educational advocate, founder of Tutoring Services, LLC and someone who simply wants to see you put more bread on your table... and be more appreciated for your efforts vs being treated in a disrespectful way by your school students. So now that you read to what I had to say... consider this... what if you were able to reach your financial freedom earlier, and get to quit your teaching job? What if Rome Wells guided you in the direction for how to do that? What If Rome Wells motivated you to get closer to your financial freedom by doing something incredible... ? What if Rome Wells helped you discover yourself for how to increase your income? What if Rome Wells helped you perhaps not leave your job just yet.. and helped you figure out how to transition from your full time teaching job into the world of commercial real estate investment, while still using your teaching expertise... and making part time income on the side... while also making money from commercial real estate? What is your biggest fear? Losing your teaching job? What If i showed you how to crush this fear and showed you small actionable steps that you can take to reach your financial freedom goal and get out of rat's race in 3 to 5 years...or at least be able to position yourself in less stressfull situation then where you are at now in terms of working all day and wasting many hours? Now you may say Rome Wells.. all that is super interesting, but what about your search engines? 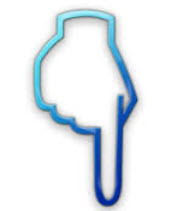 Did you give up on all of the search engines that you created? What makes me think that you are not just going to jump to the next great thing after you realize that commercial real estate is not as good as it use to be or lose your passion? Indeed these are very valid question... historically speaking my mindset is in the pivotal world.. where I Pivot in the direction of what makes most sense... but If i was to teach you the things.. that can help you develop that pivotal mindset as well in the world of real estate to help you get out of rat's race wouldn't that be something that you would want to learn? Or perhaps you prefer to work until 65 years old as a teacher? Look I am going to be honest... I failed.. many times.. but I didn't give up trying.. and in fact... many search engines that I created.. i still leverage for expanding my influence in commercial real estate across multiple professions... it's just i realized that what I was doing with the search engines as I was trying to help out teachers..
Plus I can show you how to network with people, to expand your brain and mindset and capabilities in the direction of being able to reach your financial freedom goal. Plus I will do that in such a way that will allow you to see what the real estate commercial investment is all about from 360 degrees view across multiple timelines... in such a way that will help you minimize risk... while helping you maximize your chances of making money... either using passive income... or... making money using... active income... in commercial real estate investment world. Wouldn't it be nice to not teach every day in school and get passive income from commercial real estate rentals? Wouldn't it be nice to perhaps tutor only on part time basis make some money to supplement your income with tutors you enjoy tutoring? 1 on 1 tutoring is heck of a lot different vs teaching in school ( i probably do not need to tell you that)... in my case 1 on 1 is extremely enjoyable.. Teaching 1 on 1 can be great since you can still supplement your commercial real estate investment business with... your teaching... or perhaps driving Uber on part time basis... but be able to do this.. without feel like you are being tied down to your full time job! Now... i myself haven't quit my full time job... but I placed my self into planning mode in 2018... January 1st.. the financial freedom planning goal.. and started reverse engineering entire field.. from every standpoint... and started seeing patterns for how to dive out of rat's race.. the patterns that i simply haven't seen before! The patterns that I only started seeing after planning to dive deep into commercial reale state.. while at the same time doing so in such manner that helps reduce risk. You will see me really passionately working hard and explaining and teaching... and expanding the network and sharing lots of secrets with you... free of charge and also you will see me providing other references that are more structural in the form of online courses, coaches etc... the time saving mechanism that can pretty much propell you in the direction of rapidly expanding your mindset in the direction of increasing your learning effectiviness in real estate and minimizing risk. Note... I may not be super duper real estate guru.. as you may want to think.. but at least I am close to the caliber level of your own self... and someone who is actively seeking and trying to reverse engineer ways for how to break out of rat's race... and if you are one of such folks... who also want to learn how to get out of rat's race.. then join me Rome Wells in my journey of discovering financial freedom by leveraging your already existing skills of teaching and getting out of rat's race in 3 to 5 years. Note.. Just because I say 3 to 5 years.. doesn't mean that you will become free in 3 to 5 years.. it's just can either means major major major change in your life will happen that will result in you having a lot more free time... while shifting your mindset into doing something what you already good at on part time basis. Or depending on what type of deals you dive into 3 to 5 years can literally means you stopping teaching completely and doing commercial real estate investment full time. Either any of the following can and will happen if you take action and apply measurable risk analysis behind every deal that you analyze. I will show in many of my references for how to analyze deals... and will reveal to you the secret tools that i have used myself the very same tools that helped me see the math behind the numbers and cath the "aha" moment and realization that getting out of rat's race is possible. Plus the best part about me offering to you way to learn more about real estate and get out of rat's race is the very simple fact of it all that.. you can hire other real estate coaches... because face it after all.. who would want to hire Rome Wells to teach real estate 1 on 1... basis providing that Rome Wells himself was only exposed to commercial real estate for 1 month.... only since January 1 2018.. Remember the saying? These who can't do ... teach? Read and see what I tell these folks... similarly like I am telling you secrets about commercial real estate, I also share the same secrets to other folks...but... only few out of many take actions... Be the one who does take action and visit this link to learn more about investing into commercial real estate. (remember... i only started in January 1st 2018 diving into it, but also remember that the person who would teach you... is the 21st century educational advocate (commonly referred by many students as Mark Twain of modern 21st century educational advocacy).. who also spent past 10 years researching how process of learning works.. and can rapidly infuse information into your brain... something that no ordinary experienced folks can do..
that expertise of teaching and infusing information came from many years of failing... and finding angles for how to increase learning effectiviness of human brain, plus remember Rome Wells is a certified math teacher for the state of CT and the guy who is literally a networker..
when it comes to extremely compleax deal, I would refer you to obviously someone who is either very successfull or to an online group coaching sesion or to any other resource. Commercial real estate investment is one field that you can actually learn! vs attempting to open up your own software business for example... trust me! I went through multiple timelines and multiple podcasts across different real estate gurus and went through researching multiple professions and realized... that commercial real estate investment is the the only field that truly makes sense from generating wealth... anything else is just secondary factor.